thanks all !it;s a lot of fun playing around with light these glasses..I'll move up to wine glasses soon :)I had to desaturate the shot a bit, the mild yellows of the champagne one after the other collected together to make a very unappetizing looking yellow :))very unexpected problems !! Man, you're gonna be sloshed by the time you finish experimenting with the glasses. soft, relaxing -- power of suggestion, perhaps? 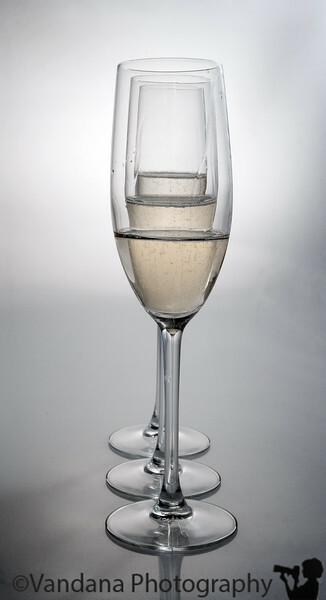 Nice shot, I like the different levels of champagne and depth. Super Vandana! Great composition! Glad to see you're having so much fun. Hope you're enjoying the subject after the shoot! And judging by the half-empty champagne glasses ... she's enjoying the bubbly entirely too much as well! Excellent composition and light.